We’ve composed these knitting lessons for the beginners, who hold their knitting needles for the first time. 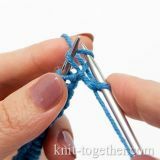 You’ll learn how to: make knit and purl stitches, cast on, trim the side edge of cloth and fasten off, add and reduce stitches and many other things. Upon completing the knitting course for the beginners, you’ll be able to knit simple things as well as understand patterns and descriptions in knitting magazines. And, if get captivated by the knitting art, you will be able to upgrade your skills. 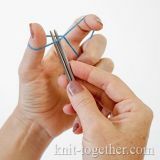 A short knitting course is not intended to cover all the knitting methods – there are a plenty of them. One and the same knot may be made in different ways. The more you know, the easier will be for you to select the best one. 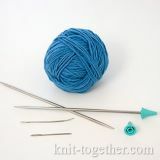 At the first lesson, we explore the tools and materials you will need to prepare for our future lessons: needles, point protectors (needle stoppers), yarn and yarn needle. 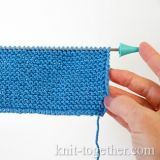 Knitting is started from making a foundation row of stitches or initial row of stitches. Within the framework of our lessons for the beginners, we'll learn how to cast on in the main way. This method is also called the classic or the basic technique for casting on the foundation row with needles. 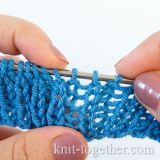 At this lesson, we will learn how to make the knit stitches in a classic technique, how to form the side edge of the knitted cloth and create the garter stitch. 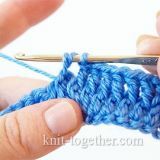 In this lesson we learn to fix the stitches of the final row using the main technique. This method is used the most frequently. It will suit for the most patterns. The main technique of binding off produces a smooth and rather elastic edge of cloth. 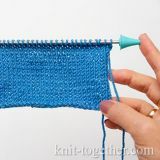 The second main knitting stitch is the purl stitch. 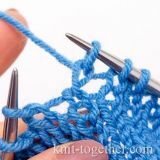 Knowing how to make two main stitch types - a knit stitch and a purl stitch - will help you in knitting a plenty of simple and beautiful patterns, where only this combination of stitches is used. Now we learn to make a classic purl stitch. 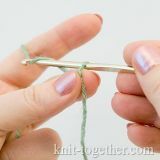 A classic way for making knit stitches and purl stitches is not the only one. There's one more method, it is called "granny's" knitting method. It is used not so often as a classic one (in our next lessons, you'll know the reason why), but sometimes it is necessary for knitting some patterns and elements. Let's consider the topic Twisted Stitch in more detail. 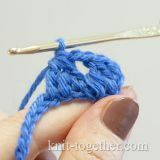 The understanding of what the twisted stitch is means a lot for neat and masterful knitting. The twisted stitch it is not a stitch knitting method, but its configuration. So, let's see what does the twisted stitch look like. 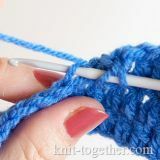 Today we tell you how to add stitches. Yarn over is one of the mostly widespread means for increasing stitches in knitting. It is used both for knitting pattern, and for give shape. 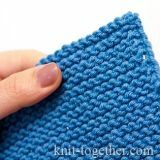 In this lesson we tell you how to knit decrease stitches. 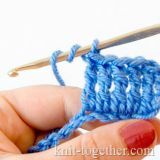 There are two main methods to decrease stitches: to knit several stitches together and method of pulling. Now we will consider the method of knitting of stitches together.